I hope you are having a wonderful week, getting ready for the spring season. I have spent the last two days sorting out my wardrobe, getting rid of the winter stuff and brightening it with warm colours! This week I decided to film a haircare video as haircare is a very big part of my beauty routine so here we are! Please let me know if you have used any of these products and send me your favourite products recommendations! Once again, Libbie Club is here! This month the box contains products which help you boots your complexion, skin and mood. For those of you who don’t know, Latest in Beauty has launched a Beauty Box for bloggers called the Libbie Club. The bloggers receive special offers especially for their readers, who can buy great quality beauty products for less. The discounted products are available here! Enjoy! This is the first time I tried products from Salon Science and I must say I really like them. Mainly because I have dry hair so I need something hydrating and repairing. The shampoo contains powerful plant stem cells extracts from rare Swiss Apples which reapairs the hair, enhances volume and has antiageing properties as well. The products smell amazing! The smell is very fresh with a hint of sweetness from the apples! I was satisfied with both products as they volumised and hydrated my hair, without weighting them down, plus my hair smelt gorgous throughout the day! SPECIAL OFFER! Free Hair Mask with Shampoo and Conditioner! Save £21! This is my favourite product from the February Libbie Club, it is a real beauty gem. It contains 14 active ingredients, and 6 antioxidants which help to boost radiance and vitality. It is filled with vitamins, proteins and antioxidants which hydrate and revive your skin. The ingredients are 100% natural which is another plus, especially since I am trying to use more and more natural products. SPECIAL OFFER! Free Cleanser and Night Cream! Save £20! In the fast paced environment, we are often exposed to stressful situations and we do not have too much time to relax. The balm by Scentered will help you soothe your mind, and ease your tensions.It contains neroli, chamomile and mandarin, but for me the most prominent are the notes of neroli and mandarin, so if you are a fan of those scents, this balm will be ideal for you. I applied it on the pulse points and temples during stressful moment, before going to sleep or when I simply needed some aromatherapy. The packaging is very convenient and lights so it can be easily carried in a handbag, and used on the go! It is time for favourites once again! This month I decided to focus on skincare, healthy eating and sports which you probably realised by looking at my favourites. This month I also attended the London Health Show which inspired me to focus on my health and wellbeing, as external beauty is in fact the reflection of inner health. This January I have been using this new Beauty Sleep Elixir from Beuti Skincare. First of all lets all take a moment admiring the packaging, it is so cute and gorgeous! It is a 100% natural product, containing 98% organic oils. It contains 14 precious plant oils which support the skin barrier, fight inflammaging, and counteract irritation as well as inflammation. The oils are well known for their anti-oxidant properties, which support the skin barrier. I usually applied this product in the evening after I cleansed my face, and followed with a moisturiser to supply my skin with all the precious nutrients, minerals, vitamins and omega 3, 5, 6, 7 and 9. After the night treatment I woke up with a hydrated and glowing skin. What I liked about this product is that it was 100% natural so I knew that it is healthy and good for my skin. I always come back to the cleansing balms during the winter months, as they are hydrating and the routine is very relaxing. This month, I have been using the balm from Skin and Tonic, a British, organic brand. It has a minty, eucalyptus smell which has a calming effect on your body and mind. Lately I am a fan of messy hair look. I love the ‘out of bed’ style, messy waves or ponytails so when I saw this in Boots I decided to give it a go. My hair is naturally quite wavy but I don’t like to use mousse as it sticks them together and they look terrible so I was hoping this will enhance my waves. This is a new brand that I discovered during the London Health Show and I am happy to say that a healthy energy drink has finally arrived. As many of you, I am quite busy and often I do need to just keep going. I cannot drink all those sugary, drinks with taurine as they simply make me feel like I am about to have a heart attack and I feel worse than when I am tired. I know I don’t normally write about non beauty products but this definitely deserves a mention. The Sunsoul drinks are designed for women. They are low in calories (only 84) per can, and they are made with 100% natural ingredients such as Guarana, kola nut and baobab which give you energy without nasty effects on your body. They taste amazing as well, my favourite so far is the Raspberry and Elderflower, but you can also get them in flavours like Spiced Mango and Pineapple or Lime and Lemon. I have some exciting news to share with you today! I have been thinking about this for a while and I finally filmed my first video featuring Empties:) Please let me know what you think and what you would like to see next. Enjoy! I am so happy I can wish you all a Happy New Year and I hope 2016 will be as wonderful as 2015. I know it is two weeks late, but it has been so hectic that I had no time to post anything. The good news is that I am back! As always I have December favourites that I wanted to share with you, please let me know if you tried any of these and what you think about them! The Aurelia Cleanser is filled with probiotics and peptide technologies which help to protect the skin, revitalise it and prevent it from ageing. It is also 100% Bioorganic which is one of the reasons I fell for it. It contains Baobab which is rich in Omega 3, 6, and 9, firming Kigali Africana and antioxidant Hibiscus and of course the ingredient which are responsible for the scent so Chamomile, Rosemary, Eucalyptus and Bergamot. I hope you had a lovely Christmas and spent some quality time with your loved ones. I am sorry I haven’t been posting a lot but I have been very busy with the whole gift preparation, decorating house and of course spending time with my family and friends. This month I received a great subscription box called Dollibox. You can find out more information on Dollibox website. Enjoy! If you read my blog regularly you will know that I am addicted to hair products, and that my hair is sometimes impossible to manage as it gets quite dry and tangled. I tried Osmo products before and I was very satisfied with the results so I had quite high hopes for this one. Of course I was not disappointed. This mask is designed for dry and damaged hair, and it aims to ‘restore moisture and elasticity, leaving hair feeling silky, smooth and manageable’. Filled with wonderful ingredients such as Jojoba Oil, Patchouli and Ylang Ylang, it promises to moisturise, smooth, tame frizz and control excess sebum. You can use this mask as a short (3-5 mins) or long treatment (7-10 mins). I always go for the longer treatment as it works better. The mask is quite thick and creamy and it smells amazing, I found the scent a bit nutty, I cannot quite describe it. The mask made my hair smooth and hydrated as promised, lovely product! 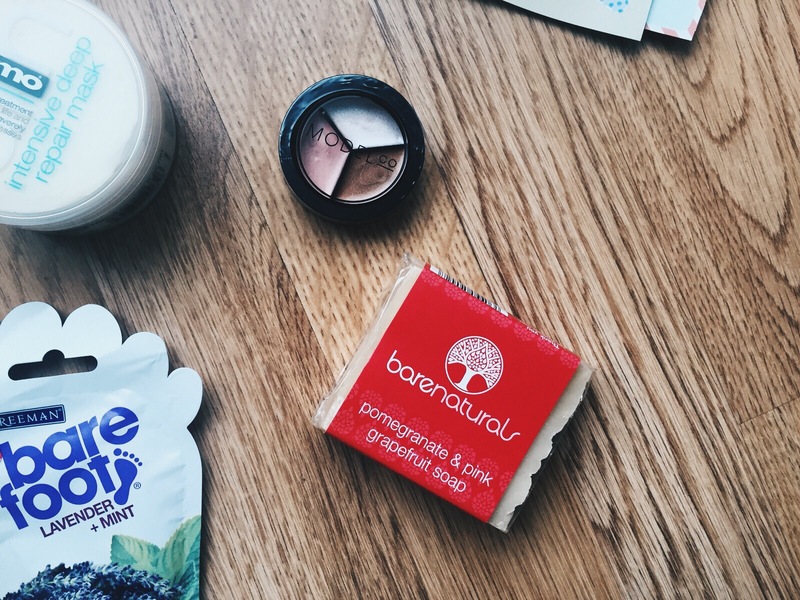 Another item in the box was a soap from Bare Naturals. It is 100 % natural, vegan, paraben & SLS free and it is handmade in the UK. It contains grapefruit essential oil which is known for its revitalising and cleansing properties, nourishing pomegranate and other oils such as coconut oil and olive oil. As you can imagine it smells sweet and fresh making it perfect for my everyday hand soap. 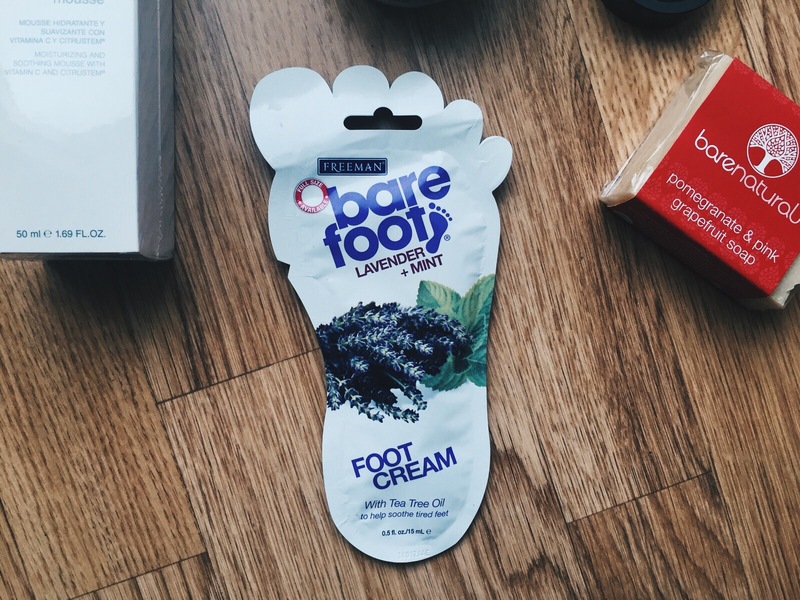 This foot cream could not arrive at a better time, after Christmas Eve and the busy December month my feet are in need of a treatment. It is filled with tea tree oil, lavender oil and peppermint which help in soothing and relaxing tired feet as well as reinvigorating muscles. I think this box is great as it contains products from all the beauty categories like haircare, skincare, makeup and body care so everyone can find something they will like. All the products included in the box were good quality and they worked perfectly with my skin. I would get it again! The December box is available until 31st December so order soon if you would like to get those fantastic beauty items from Dollibox website! I hope you are all getting ready for Christmas and have started decorating your homes, packing your xmas presents and also finding some time for yourselves! Since there is not as much time left, I wanted to give you some gift ideas, and inspirations for your loved ones, your friends or even for you. The shopping destination that I recently discovered is called Au Sujet De Vert, where you can find the best selection of organic niche products such as Hairy Jayne, Tabitha James Kraan, Carishea, Ermana Natural Skincare, Lyonsleaf, Cime Skincare, Vedani Botanicals, Rossi Uvema. One of the cool things about this store is that if you live in London Area W1, your products will be hand delivered to you for free! This balm is a multi-purpose products so it is ideal when you travel as it has many different uses. The ingredients have antioxidant properties, and the balm heals, smooths and protects the skin from any external damage. It works amazing as a de-stressing balm. All you need to do is apply it to your wrists, and temples and massage it into the skin, then inhale the divine scent of the oils. It can also be used on dry areas heeling the cracked skin. I do suffer from dry skin, so applying this balm on my elbows really made a difference, especially that it has this waxy texture which I find works best on damaged skin. This Golden Citrus 4. in one conditioner is also a multipurpose product, as all the items I am reviewing in this post. It can be used as a conditioner, a leave-in treatment, scalp moisturiser or a styling product which is great as when you are travelling instead of taking 4 product you will only need to take this one. Lyonsleaf Beauty Balm is another multi-tasking product. It is a cleanser as well as a moisturiser. It has cell regenerating properties helps prevent spots and helps boost skin’s natural sun protection systems. I had a small sample so I tried to use it as a to cloth cleanser. It has a lovely, herbal scent and the balm is easy to apply since it is not as solid as some other balms. I applied it to dry skin, then massaged it in to melt any make-up and used a hot cloth to remove it, breathe in the scent while having the hot cloth on your face. The balm removed all the make-up well, leaving my skin feeling clean and ready for a moisturiser. The ingredients are ideal for any hair problems, they will nourish the scalp as well as the hair, prevent hair falling out and promote growth. This oil is suitable for all hair types and all ages. I applied this oil before washing my hair and left it on for 1-2 hours but you can also leave it overnight. I found that the applicator was very good as the oil did not spill everywhere which always tends to happen to me! First thing I noticed was the scent which is beautiful and relaxing, it is quite herbal and you can smell the notes of the lavender and ylang ylang so when the oil is working in your hair you will also enjoy the aromatherapy which will help you unwind. The oil made my hair smooth, shiny and got rid of the frizz. I did feel very relaxed and sleepy after using this oil so it definitely has sleep promoting properties. I feel like this this Pre-Shampoo Oil could be a part of Spa treatment as it has the gorgeous scent, professional packaging and great results. I hope you all had a good month, and are already starting to feel the Christmas atmosphere. I did not even realise when London started to look so magical once again, the lights are everywhere, the ice skating rings are filled with ice skaters and the window displays look wonderful. This month I have been focusing on skincare and body care as with the colder months, I noticed that my skin is more vulnerable to damaging effects of temperature differences. When I discovered this mask in Selfridges, I was amazed by the beautiful smell of the Manuka honey. It was the main reason for my compulsive purchase (guilty as always). Having tried and tested this tube of wonder, I can honestly say that this has become one of my favourite masks. It is moisturising, cleansing and has antibacterial properties, so it is great for all skin types. Best. Primer. Ever. This is a must-try product for every beauty fan out there. I always thought that if you don’t wear liquid foundation, there is no need for a primer, until I tried this one. I don’t use a lot of make-up and I tend to stick to powder foundation as my skin is not problematic. I noticed that before I started using a primer, half way through the day my concealer and powder seemed to disappear and I had to reapply again. It has been a long time since I reviewed L’Occitane, but as a loyal fan, I always end up in their stores, trying products and purchasing new items. I tried this product last year, and got another sample this year. I always seem to try it during the autumn and winter months, and it just fits in with the cosy evenings, candles and winter weather. The texture of this cream is very light, so it sinks into the skin almost immediately, hydrating your skin. Like the whole Shea range it has a comforting smell, so it is a cherry on top during my pamper evenings (Available here, £26). You can use it as a day or night cream, but for night I would recommend the more hydrating version Shea Ultra Rich Comforting cream. (Available here, £28). During the colder months, my hair becomes very dry so I need to use a lot of hair oil to ensure it stays smooth and shiny. This month I chose Aveda Dry Remedy, as it is filled with the amazing BBuriti oil, which ensures that the hair stays moisturised, supple and shiny. The Libbie Club wants to bring the beauty industry closer to their customers and thrives to build the largest community of brand ambassadors. To get the special offers go to my Libbie Club Profile and treat yourself and your friends! La Montaña candles are inspired by Cass and Jonathan Hall’s new life in a mountain village in Valencia. Each fragrance evokes a real experience, and is recreated using only the finest perfume oils. La Montaña candles are 220gms of top quality wax (burning for at least 40 hours), include a high percentage of natural and essential oils, and are hand poured by artisan candlemakers. All candles are gift-boxed and cellophane-wrapped. SPECIAL OFFER £25 instead of £35. Save £10! A pioneer in botanical formulations for over 30 years, Crabtree & Evelyn blend the very best of nature and science, tradition and innovation, to create benefit-rich bath, body and home care. Presented in a beautiful Christmas cracker shaper box, this hand cream will leave hands moisturised and noticeably smoother. Crabtree & Evelyn’s award-winning Hand Therapy formula features a blend of Shea butter and macadamia nut oil to keep hands soft, supple and smooth. I am always using hand creams so when this came in my Libbie Box I was very happy. It smells like apples and it definitely fits in with the Christmas season. It made my hands smooth, nourished and of course they did smell heavenly. I am loving that this month’s box is so inspirational when it comes to gifts 🙂 This cracker hand cream is the perfect stocking filler! SPECIAL OFFER 3 for £15. Save £5! Hair Perfume with Heat Protection freshens hair up between shampoos. If you find washing your hair a pain-in-the-neck, or just prefer not to do it too often, this is for you. It adds shine, calms frizz and fly-aways and protects hair from damaging heated styling – all in one spritz. The bright floral fragrance is made from essential oils (aroma compounds extracted directly from plants). The smell evokes a nostalgic feeling of sitting in a sunny English garden. SPECIAL OFFER £12 instead of £25! Save £13!